For my fifth interview in the Workers of Woodbridge series, I drove up to the corner of Trumbull and Hancock and walked a half-block west to the old building I used to live in — 1524 Hancock. It’s the brick building that faces the vivid alleyway mural “Wake up and start dreaming.” For me, this is where Woodbridge begins and ends. It was where I lived and breathed. Three guys wearing navy blue shirts with “McDaniel Maintenance” on the breast were busy hammering away at shingles. I yelled “Mike?” and all three looked down at me. 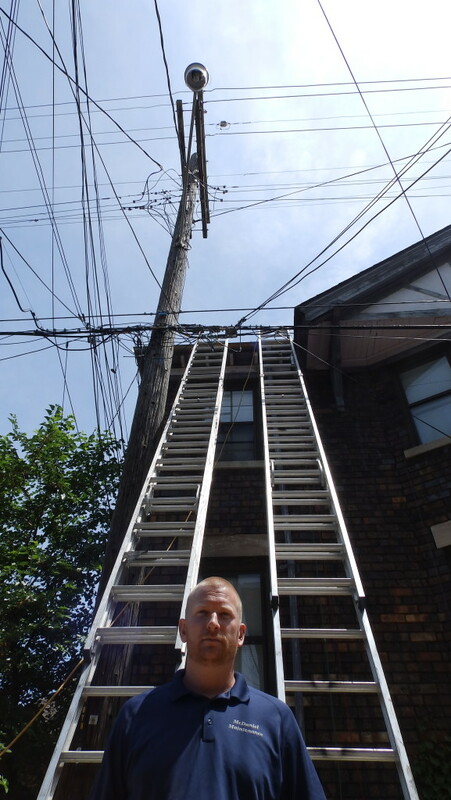 The guy standing above them all with short red hair and fair Irish complexion (though roofer-tanned), nodded and made his way toward the ladder, and then down it. 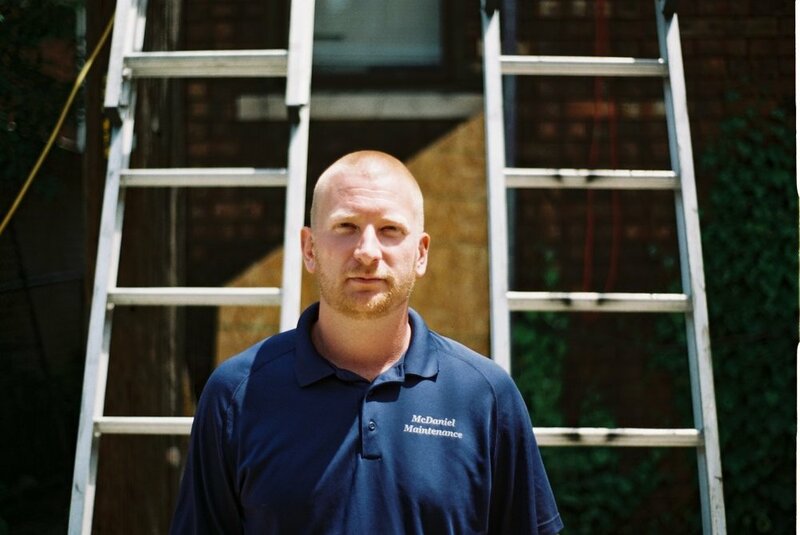 Mike McDaniel owns and operates McDaniel Maintenance, a company that’s been doing work in the Detroit area since 1942. He’s a fourth-generation tradesman with an eye for Detroit, and an old-fashioned sense of quality. Most of the company’s clients come from word of mouth. They rely on their reputation for work, and it’s an effective strategy. After my visit with Mike, I can see why. TL: Where did you learn the trade? MM: I’m fourth generation. We’ve been working in the Detroit area since 1942. They (Mike’s family) came from the Pennsylvania slate mines, worked their way over and started then. Of course, at that time it was popular to go work in the factories. So, they worked in the factories and still did slate tile roofing and construction part-time. From there it just took off. My dad was doing this when I was growing up. He decided he didn’t want to do it anymore and I revived the family business from there, around ’98 or so. It was about 2000 I started doing it full-time. Ever since then we’ve been doing general contracting full-time. MM: Ten years old. It was kind of the family tradition back then. At ten you go to your first job site — see what’s going on with that. From ten to thirteen, it’s required that if you’re not playing a sport or playing music in the summer you’re working in the office. You learn customer service, empathy. You learn how to deal with people and treat them with respect. And at thirteen years-old, that summer, if you’re not into something extra-curricular, you go out on the job sites and start working. MM: It is. I’m half-Irish, half-German. TL: Your family, they’re Detroit people, then? MM: Yeah, from what has been told to me, my great-grandfather was back and forth between Pennsylvania and my grandfather lived in the city for a while and then moved out to the suburbs to be closer to the factories out there. He was working at the Rawsonville Ford plant and the Willow Run plant. TL: When did you start working in this area? MM: I think I met Larry back in 2003 or 2004. He saw us working on a building out here and came over and started talking to us. At the time I was partners with another company that was doing mostly slate and tile roofing at that time. We worked together and merged our crews. There’s not a lot of people around here who know this stuff. You get some companies that will do the shingles, but not too many. Their understanding of it is very limited. When you get into Woodbridge, Boston-Edison, Palmer Woods — these historic districts with big houses that are close together, there’s limited access and unique situations. The companies that are willing to give it a whirl — you can count them on one hand. TL: Describe slate and tile roofing, for someone who doesn’t know the difference. MM: Slate and tile requires traditional techniques. You’re not going to use modern power tools. Shingles, nowadays are designed for homeowners to put on themselves. Slate and tile is very individual. There’s a lot of math involved — a lot of measurement. There’s a lot of precision with it. Some people say it’s an art form, versus just labor. TL: A lot of the buildings around here are done that way? MM: Every single building in this neighborhood, at one time was either slate tile or cedar shingling, cedar shake. Of course most of them have been torn off over time. But, the way they were designed — when you go back to them with asphalt shingles, it almost requires the same technique. There’s a lot of measuring, a lot of precision, a lot of carpentry. There’s a lot of complexities. TL: How much work are you doing in Woodbridge this summer? MM: This year, about two months. Something like the building we’re working on now can take anywhere from seven to eleven working days, on-site. I think we’ll probably do six for Woodbridge Company this summer and we’re talking about an additional two. TL: You’ve been working in Woodbridge since 2000. So, for fifteen years, you’ve been on the tops of houses to see how the neighborhood has changed. MM: The amount of money that folks are willing to spend…Back then it was looked at as, Detroit will never come back. There’s no hope for the city. And, a lot of the people who have lived here, and a lot of the investors viewed it the same way — I’m not going to put $25,000 into a roof, when I’m not even sure if this building is going to be worth that much in ten, twenty, thirty years. So, it was a lot of repair work. Just, patch me up until next year, over and over until five years goes by and there’s no more patching that can be done. Now, it’s completely the opposite. It’s: do what’s right. Make sure it’s going to last. I want it permanent. Before, no one ever cared about putting anything back, historically correct. They didn’t care what you used. As long as the water stays out — as long as the squirrels stay out, that’s all they cared about. Now, it’s: get me as close as possible. I’m willing to spend that extra 15% to get that board that matches perfect. They don’t want to go full bore; it’s not something like Greenfield Village, but they do want it to be close. TL: And this is a completely new sentiment? MM: It is. I’d say probably in the last three years that’s really been changing. TL: What do you see in the future for Woodbridge? MM: I see Woodbridge slowly turning over to owner-occupied units. Once some of the investors start seeing their careers wind down, I think they will revert back to what originally got them into it — the mentality of I want the neighborhood to be a community. Ultimately, the way to do that is to have these units owner-occupied. I think slowly these units will transfer over to people who are going to live there. If you talk to a lot of these investors that have large quantities of property, every single one of them will tell you that the reason they got into it in the first place was because the house next-door to them was in bad shape. They didn’t want to see it fall down. There is some kind of personal connection to the neighborhood and why they got involved with it. Over the years it evolved into what it is today for each of those individuals. From the person who owns the duplex next door, to the person who owns several buildings like Woodbridge Company does. TL: I’m kind of fascinated by the tradition of business where empathy is passed on as well as the trade. Can you talk more about that? MM: Human interaction. People would call and they’d explain their situation. Something as simple as taking the fifteen minutes to stay on the phone with them. Let them tell you what’s on their mind. What’s their situation? Why they are where they are. You do what you can to help out. TL: It’s an old mentality that seems to be gone now. It’s not the mentality of “I’m going to get rich off of one person.” It’s: “How can I make a relationship with that person that will help sustain us both?” That way of thinking is gone, it seems. MM: I was fifteen or so, and there was a conversation between my father and a marketing man. The marketing man was trying to sell him some kind of package in the Yellow Pages and my father, very clearly, explained to him that we already advertise every single day. When we leave this office and we go to work, every day we advertise. When we pump gas, and people say “Hello,” they see the name on this truck. Relate with people; talk to them. That’s how we handle things. To this day, it still works. We don’t advertise. You will not find us out on the internet. Our work comes from people who know us, people who see us passing by, conversations at a gas station. Just like Larry found us working on someone else’s house. He came over and talked to us and we slowly built a relationship from there.